The annual Academy Awards ceremony, more commonly known as the Oscars, is not just about honoring achievements in the film industry. It is also one of the biggest fashion events of the year. In this post, we will show you some of the best and worst dressed celebrities at the Oscars 2014. One of the most beautifully dressed celebrities at this year’s Oscars was Lupita Nyong’o. She wore a powder blue Prada gown and a headband. The Kenyan star from 12 Years a Slave looked like Disney’s Cinderella. Nyong’o told reporters that Prada designed this gorgeous gown just for her. Cate Blanchett stunned everyone at the Oscars ceremony in a cap-sleeve, embellished gown from Armani Privé. The actress revealed that the dress was heavy, but she loved it. Just as expected, the actress never fails to impress. The sequined gown with light gold Swarovski baguettes gave her a romantic look. Sandra Bullock looked amazing in a beautiful, navy Alexander McQueen gown. The satin gown featured a sweetheart neckline and dramatic draping. Sandra Bullock’s hair, styled into side-swept curls, completed the classic look with total sophistication. The actress accessorized with Lorraine Schwartz jewelry. At the 2014 Oscars ceremony, Angelina Jolie was simply sparkling in a custom Elie Saab haute couture gown, Ferragamo shoes and clutch handbag, and Robert Procop 42 carat earrings. This time, the stunning actress chose to stray from her usual black gowns in a metallic gown with a cascading beaded pattern. Penelope Cruz looked pretty in pink. In her dress, she was like a perfectly-wrapped pink present. The actress looks stunning in just about anything, and this pink Giambattista Valli gown was no exception. With a simple hair updo and the right amount of makeup, Penelope Cruz managed to keep her natural glow. Among the beautifully dressed celebrities at this year’s Oscars ceremony, there were some noticeable wardrobe malfunctions and epic dress fails. It makes you wonder what they were thinking. 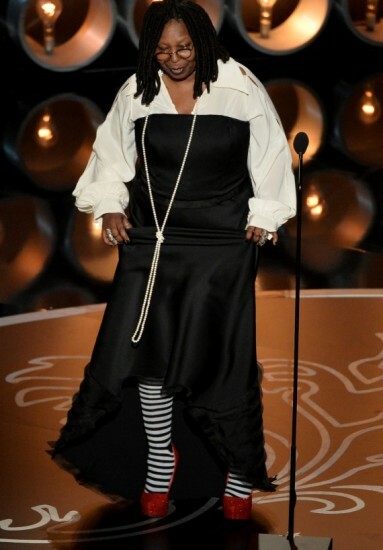 As much as we admire Whoopi Goldberg and her great talent as an actress, her outfit for the Oscars ceremony was definitely not a good choice. Tucking a voluminous blouse into a strapless fitted dress is never a good idea, and attempting this outfit at the Oscars is even worse. And if you add to that a pair of black-and-white striped tights and ruby red slippers, it becomes a fashion disaster. 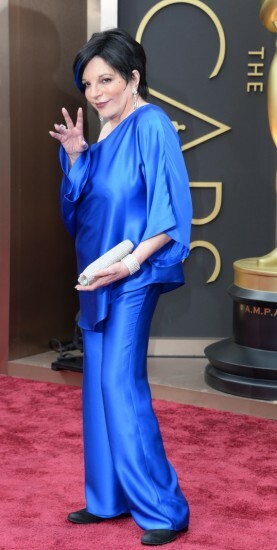 At the 2014 Oscars, Liza Minnelli sparked fashion controversy on the red carpet. She was even called a ‘drag queen’ by Ellen DeGeneres. Although this is a bit too harsh, the electric blue trouser suit, matched with a blue streak of hair dye, was a rather unfortunate wardrobe malfunction. The stunningly beautiful Veerle Baetens showed up at the Oscars in a shapeless, unflattering gown, which made her look like a sack of potatoes. The Flemish actress has a gorgeous figure, but you’ll never know it from the looks of this gown. This outfit earned her the title of one of the worst dressed celebrities at the Oscars. Julia Roberts’ peplum dress definitely wasn’t her best red carpet look. Peplum was all over the red carpet in 2013 and the actress tried to keep this trend going at the 2014 Oscars. She could have looked so much better without the distracting peplum. And the lace panel at the chest kind of looked like a fancy tattoo. Anne Sweeney also wore one of the worst dresses at this year’s Oscars ceremony. This oddly-structured blue Armani Privé opened at the waist to reveal a bright red silk accent. We don’t quite understand the fashion concept of this gown, and the shoes aren’t helping either. At this year’s Oscars ceremony some celebrities brought glitz and glamor, while others should have stayed off the red carpet. The photos in this post are just a few examples. Who do you think were the best and the worst dressed celebrities at the 2014 Academy Awards?